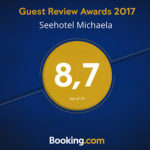 The "Seahotel Michaela" offers you 11 newly renovated, modern and comfortably furnished hotel rooms and a suite with barrier-free shower rooms. In most of the rooms you can enjoy the unique view of the reservoir for a restful night in the middle of nature. 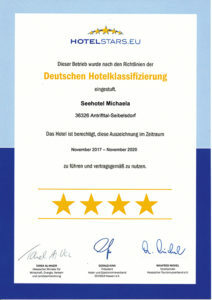 Our hotel offers 4 barrier-free hotel rooms. The restaurant, the café and the terrace are handicapped accessible. Of course, there is a handicapped accessible WC at the level of the restaurant and event hall. Of course, our hotel guests can choose their large breakfast at their own discretion at the breakfast buffet. Certainly a good start into the day!